Download RSS Channel Writer 2.1.3 - 2,2 MB What's New? RSS Channel Writer requires Windows 2000/XP/2003/Vista/7 and Microsoft .NET Framework 2.0. You can download Microsoft .NET Framework 2.0 for free from Microsoft's official website. NOTE: You can only save 3 items in your RSS feed and ping to 3 RSS servers in Trial version. Register your copy to get full access to the program features. 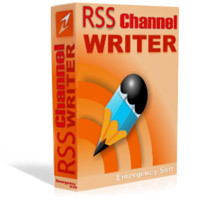 Order RSS Channel Writer now!. Windows 2000/XP/2003/Vista/7 and Microsoft .NET Framework 2.0. You can download Microsoft .NET Framework 2.0 for free from Microsoft's official website.